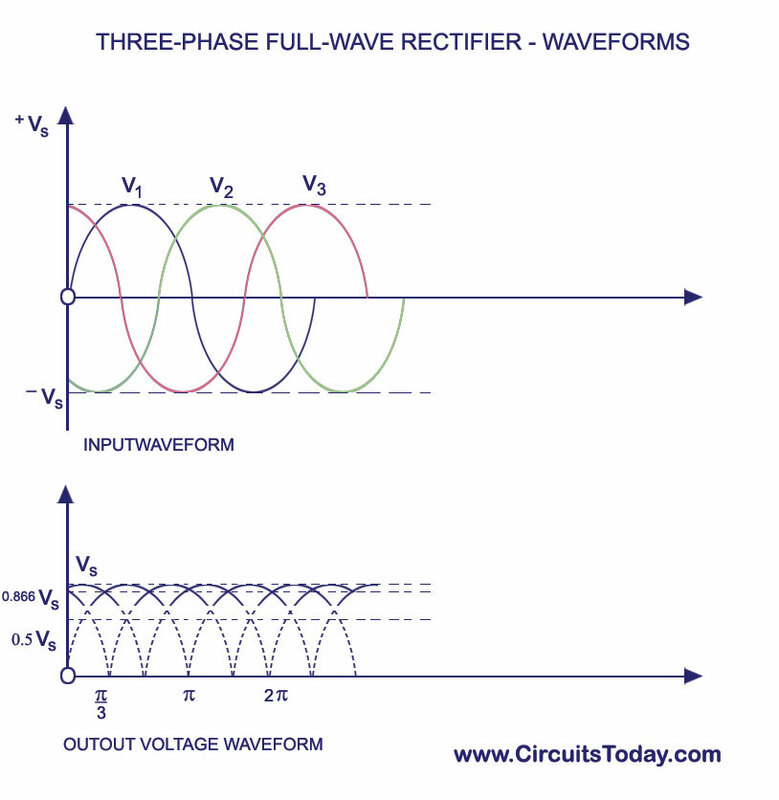 In polyphase rectifier we will be discussing in detail the working, the input and the output wave forms of a three phase half wave rectifier and three phase full wave rectifier, along with the connections of an interface transformer on a 6-diode rectifier. 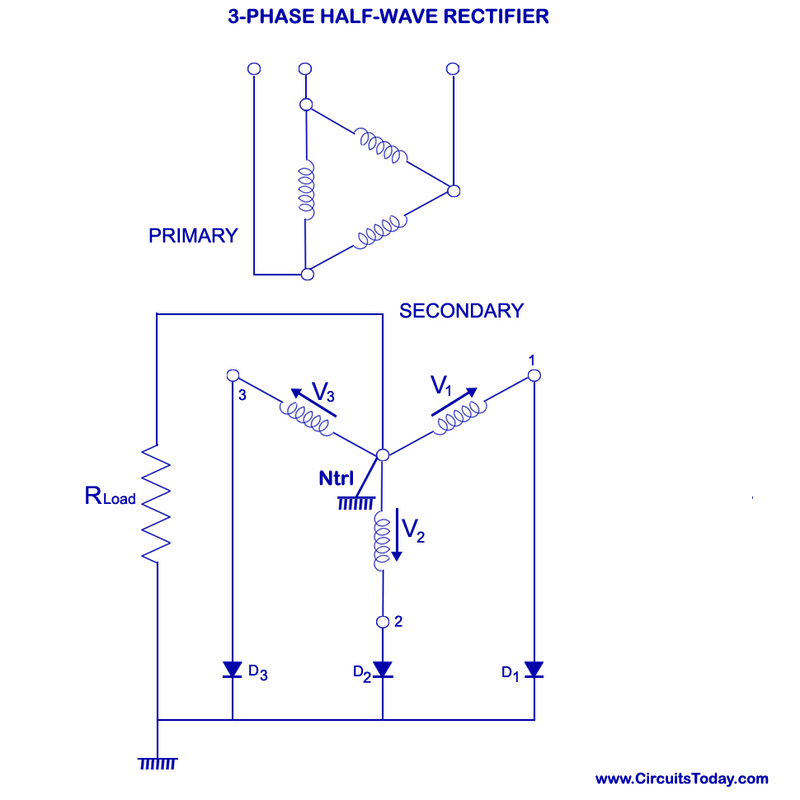 A three phase half wave rectifier, as the name implies , consists of a three phase transformer. Given below is a star connected secondary three phase transformer with three diodes connected to the three phases.As shown in the figure, the neutral point â€˜NTRLâ€™ of the secondary is considered as the earth for the circuit and is given as the negative terminal for the load. The input and the output wave forms for the circuit above is shown below. For each one-third of the cycle, each diode conducts. At the instant when one diode Â out of three is conducting, the other two are left inactive, at that instant their cathodes becomes positive with respect to the anodes. This process repeats for each of the three diodes. The voltage between the cathode and â€˜NTRLâ€™ (dc voltage Vdc) will have a value between the peak value of alternating voltages per phase Vsm and half this value Â½ Vsm. DC output voltage of three phase half wave rectifier is given below. The arrangement shown above is practised only if 3 phase supply is available.Like in single phase circuits, there is not a single point at which the rectified voltage will drop to zero, even without a smoothing arrangement. The voltage ripples are also small when compared to single phase circuits and the frequency of ac supply is three times more when compared with the former.If smoothing is needed, it can be obtained easily. 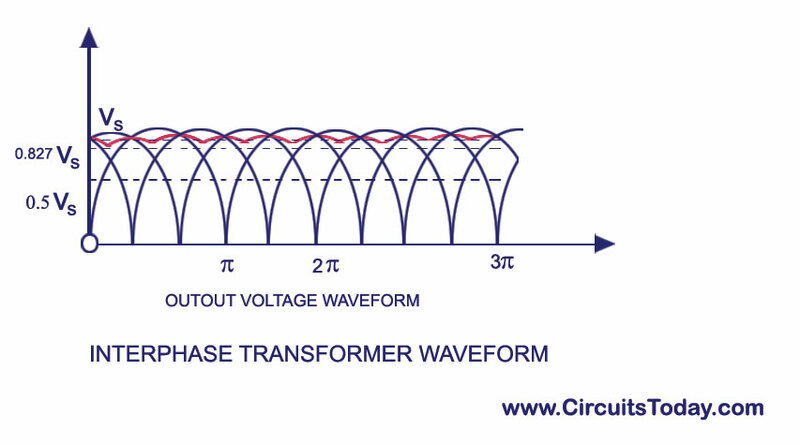 The circuit will need a zig-zag secondary if dc saturation of transformer core which is caused by the flow of direct current of each diode, is to be avoided. A three phase full wave rectifier can also be called a six wave half wave rectifier.As shown in the figure below the diodes D1 to D6 will conduct only for â…™ th of the period, with a period of pi/3. As shown in the output wave form, the fluctuation of dc voltage is less in a three phase circuit.The variation lies between the maximum alternation voltage and 86.6% of this, with the average value being 0.955 times the maximum value. Six diodes are used for the making of this full wave rectifier. As so, it may pose some problems and may also be advantageous in some cases. If we need a smoother output, the use of six diodes may be seen as an advantage.But the use of six diodes complicates the circuit and each diode operates for a shorter cycle.Also, since no more than six are used, the circuit is cost effective, as long as it is compared with the comparative increase in the output of the rectifier. As told earlier, out of the six diodes, only one diode conducts at a particular instant. 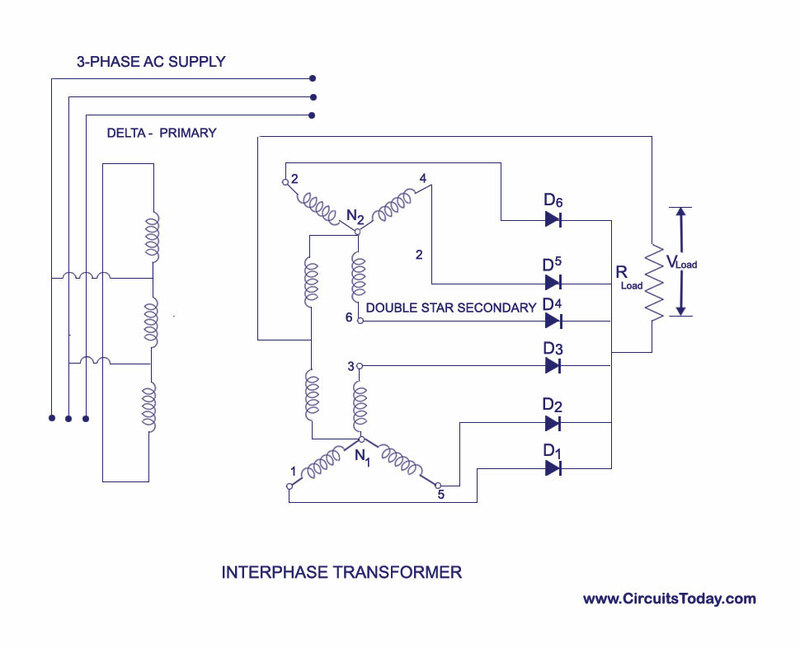 Thus, the current flows only through one phase of the transformer secondaries and primaries, at a particular instant.There will be a line- to-line current flow, with the transformer primary is being connected in delta connection. But when the primaries are in star connection, two of three phases are virtually open circuited a t every instant. 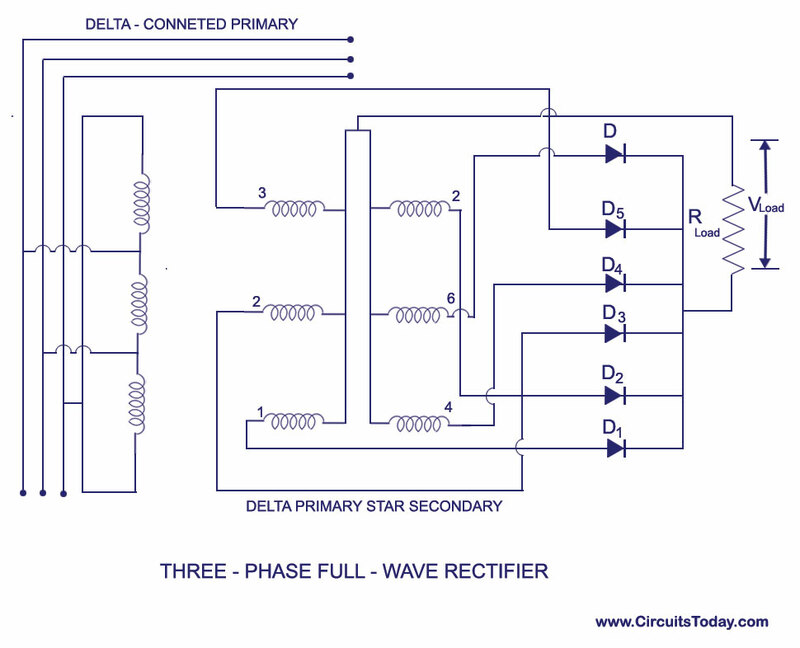 Thus for a three phase full wave rectifier,star connection is not practical. For any polyphase rectifier, the neutral point must be provided by connecting the secondary windings of the transformer as it is considered as the negative terminal of the dc output circuit. 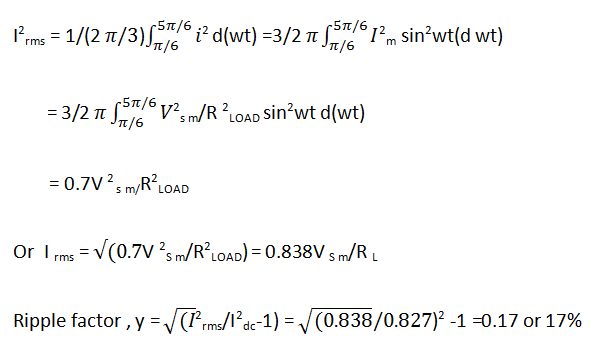 When designing a rectifier, the following factors are to be considered to determine the number of .phases. 1. To create minimum amount of harmonics generated in the output circuit, the number of phases in the rectifier circuit should be high. 2. For good transformer utilization factor (TUF), the number of pages in the rectifier should be low. 3. For low voltage regulation the number of pages in the rectifier should be low. 4. For high power factor the number of pages in the rectifier should be low. The conditions for using three phase , six phase and twelve phase rectifiers have been explained above. The advantage of using three phase , six phase and twelve phase rectifiers can be implemented together into a single circuit with use of an interphase transformer. In an interphase transformer, the diodes used in the rectifier circuits are divided into a number of groups in star connection.Each group will have three diodes.That is , for a six diode rectifier there will be two groups and for a twelve diode rectifier there will be for groups. In a normal connection the star points will be connected together. But in this circuit each group will have its all secondary windings and instead of a direct connection, the star points will be connected through an interphase transformer. The common neutral point serves as the negative terminal of the dc output circuit. Please refer the circuit shown below. At any particular instant , the potential of two diodes will be equal, and the load will be shared by those two which are effectively working as a parallel circuit. From the waveform shown below we can see that the output characteristics are similar to a six phase rectifier with parameters like low harmonics of twice the supply frequency. The load Â is shared by two three phase systems operating in parallel at a terminal voltage. This terminal voltage is equal to the mean of the terminal voltages of the phases operating together. 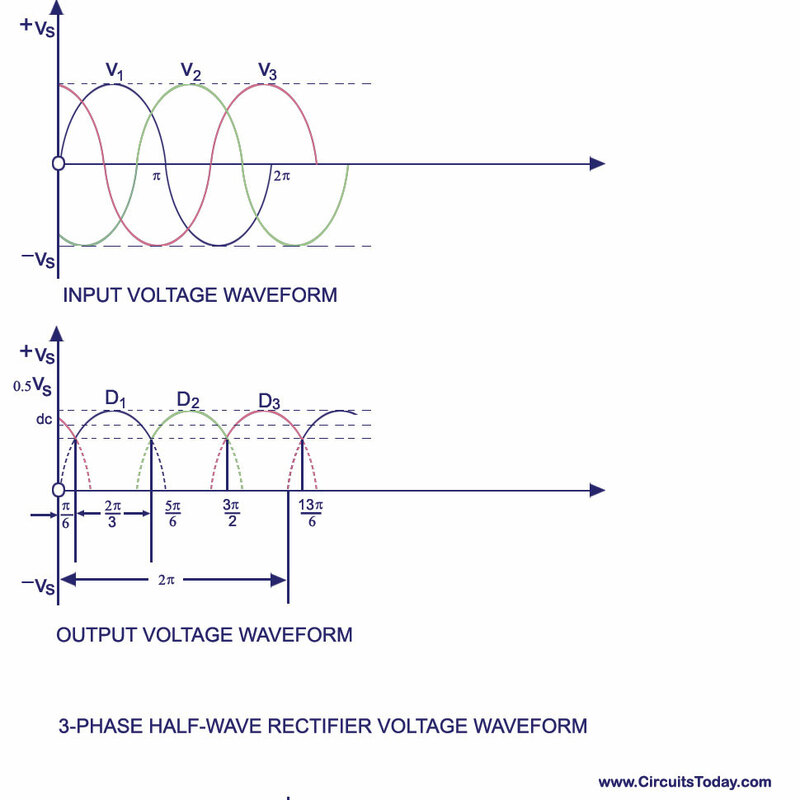 Each phase operates for â…“ rd of the cycle and the output voltage is same as that of a three diode rectifier Â circuit.